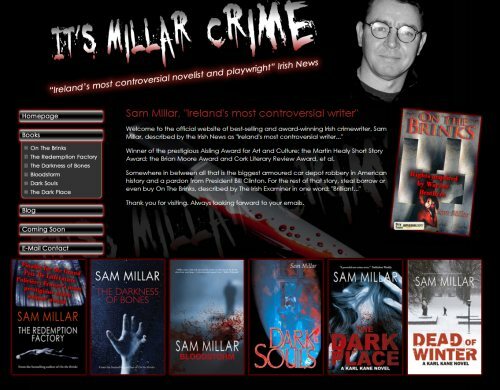 Sam Millar has been described by the Irish News as “Ireland’s most controversial novelist and playwright”. Winner of the prestigious Aisling Award for Art and Culture; the Martin Healy Short Story Award; the Brian Moore Award and Cork Literary Review Award, et al. This website features information and critical acclaim for this leading Irish writer and offers the facility to buy his books online from Amazon. They say you should always write about what you know and this is definitely true about Sam, his first Novel “On The Brinks” tells the true story about his own part in one of America’s biggest robberies, a truly amazing story that we just can’t put down.